“I have always enjoyed growing plants. As a kid growing up in Corpus Christi, Texas, I grew anything I could from cuttings, seeds, etc. At 16, while living for a short time in a rental home, my dad and I built a greenhouse. It was my first attempt at growing orchids and I failed miserably. But I was very good with tropical plants like Hoyas and begonias. We then moved to a townhouse and I successfully grew African Violets under lights and joined the African Violet Society, followed by the Bonsai Society. This was a very fun time for me. built a second one, 14′ x 20′. I had been bitten very hard by the orchid bug, and with patience, was successful this time. In 2013, I built a third. Plus, I now have 3 outdoor protected areas where I grow many types of orchids year round with no cooling (other than fans) or heat. My average temps are 30° – 110°, with extremes occurring 10 – 12 days a year. 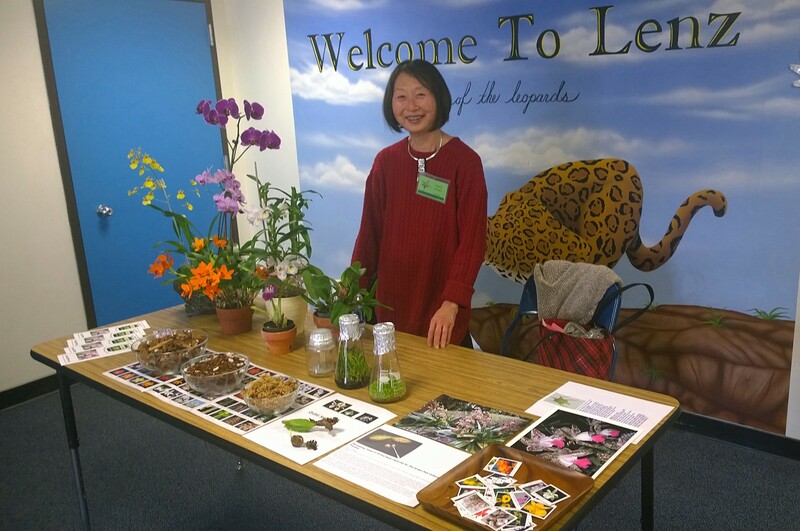 I belong to the Orchid Forum and the Sacramento Orchid Society and am very involved in both as a board member for both societies, Vice President for the Forum several times and a past President. Australian Dendrobium and miniatures. I have great interest in Dendrochilum, plus anything strange and unusual from the orchid world. JEFF TYLER will bring orchids for the RAFFLE table and have orchids for SALE. In 1980 he moved to the mainland and swore off the orchid family; not for long, as he was introduced to Rod McLellan’s ‘Acres of Orchids’. First he filled his home with upwards of 6,000 plants. Later heleased greenhouse space for his collection. A glutton for punishment, he continued to add to his collection, overflowing the 3,000 sq. ft. greenhousein Half Moon Bay. Currently his greenhouse (D&D Flowers) is in Daly City. See attachment for locations and time schedule. 1. If you would like to carpool, meet at 9:00 – Reno Town Mall parking lot on the SW corner of Peckham at Virginia diagonally across from Atlantis. (Wells Fargo Bank at corner) We will leave at 9:15 sharp. Any questions, call Taeko 313-8618 . 2. Sally and her husband have room for 3 more people in South Reno. They will leave from the Summit Mall at 9:30 sharp. ( NW corner of Virginia and Mt Rose Hwy) Call 741-8426 leaving a message if not answered. They will also stay for lunch. Under-the-trees lath house. 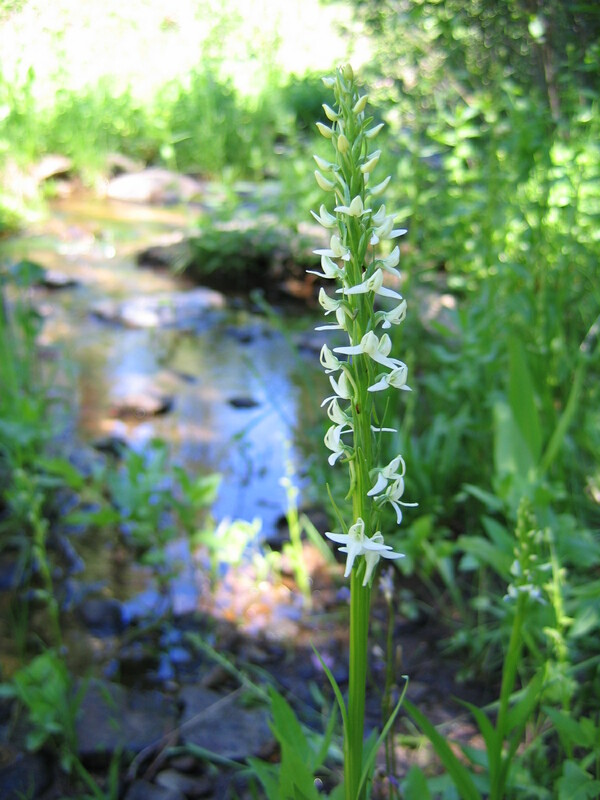 Orchids can survive & bloom under rough desert conditions. E 5th. RIGHT on Hidden Meadow. RIGHT on Meadow Ln to gray house on the right..
Commercial-style greenhouse, Rare orchids, overgrown and slowly being untangled. From 395. LEFT on Johnson Ln to top of hill. Turn RIGHT on Fremont for 1.4 miles. When you see a 45mph sign you have arrived, House is on the LEFT. One-year old greenhouse of a new-to-Nevada but long-time (10+ years) orchid enthusiast. SOUTH on Fremont (East Valley Road) for 3 miles. RIGHT on Buckeye for 1 mile, LEFT on Orchard to the 1st house that is set close (50 ft) from the road. White house. Ramon de los Santos is an accredited America Orchid Society (AOS) judge and a member of the California Sierra Nevada Judging Center. Because he Is also an accomplished photographer, he is an official orchids photographer. His photos have been published in the AOS monthly magazine, Orchids, as well as other publications. Ramon has been growing orchids for over 30 years, starting in the Philippines as a teenager. He is known for both his orchid photographs and his personal award-winning orchids. Brandon Tam is passionate about his career as the Orchid Collection Specialist at The Huntington Library, Art Collections, and Botanical Gardens in San Marino, California. Brandon’s grandmother first introduced him to orchids when he was seven by giving him a white cymbidium. He volunteered at the Huntington during high school, and when he graduated at age 16, Dr. James Folsom, Director of the Botanical Gardens, offered Brandon a full-time position as the Orchid Collection Specialist. Brandon has managed the collection for the past eight years. While working with Dr. Folsom to reinvigorate the Huntington’s orchid collection, Brandon attended California State University Polytechnic, Pomona, and earned his Bachelor of Science in Plant Science in 2015. Brandon now oversees one of the largest orchid collections in the United States, which has grown from 2000 to over 10,000 plants in the past eight years. The Huntington’s orchid collection is housed in over 26,000 square feet of growing area, which includes the Rose Hills Foundation Conservatory and three collection greenhouses, dedicated specifically for tropical plants. He also oversees the Huntington’s 50 Amorphophallus titanums (better known as the “Corpse flower”), and has successfully bloomed one in 2014. Brandon is in charge of the annual Huntington International Orchid Show, which he inaugurated in 2015, and hosted the annual meeting of the American Orchid Society at the Huntington in 2016. Under Brandon’s direction, The Huntington has won over 100 awards from the American Orchid Society within the last three years, which includes five First Class Certificates and three Certificates of Cultural Excellence. At the American Orchid Society Fall 2016 Members Meeting, The Huntington received The Merritt W. Huntington Award, which gives international recognition for the “Most Outstanding Orchid” in the year of 2015 for Paphiopedilum micranthum ‘Huntington’s Perfection’ FCC/AOS. In 2016, The Huntington received not just one, but two American Orchid Society Special Annual Awards! Lycaste consobrina ‘Huntington’s Finest’ AM-CCE/AOS received the Butterworth Award which goes to the grower of the plant exhibiting the finest orchid culture. It also received the Benjamin C. Berliner award which is given to most outstanding example of the genus Lycaste or its closely allied genera. At the time of judging, it had a total of 287 flowers and 7 buds. In Brandon’s spare time, he loves to travel, and of course…EAT! He recently joined Harold Koopowitz and others on a trek in Ecuador led by Pepe Portilla, where the group saw many wild orchids and focused on the study of Selenipedium aequinoctiale. Additionally, Brandon was elected as Trustee of the American Orchid Society, for a three-year term, which started March 2018. At age 25, he currently serves as the youngest Trustee in AOS history. Peter started growing orchids over 35 years ago, but then stopped due to school and starting a career. It wasn’t until about 14 years ago that the orchid “bug” came back and he is now heavily involved once again! He is an accredited judge with the American Orchid Society, and a hybridizer of mini-catts. He enjoys meeting with other orchid enthusiasts, and can often be found at various orchid shows and societies around the country. Due to limited growing space, Peter likes to specialize in miniature orchids, both species and hybrids, and has received numerous AOS awards. His interests in orchids include Dendrobiums, Angraecoids, and Neofinetias. He is also known as “Mr Sophronitis” as he has a passion for growing and collecting them. He maintains a collection of a thousand or more orchids at his home in Southern California in 3 small greenhouses, outdoors, as well as an offsite greenhouse. Presidents Message: As OSNN continues to grow, we need to make changes to accommodate this growth. In addition to our three annual show and sales organized by Rosemarie Entsminger, we have outreach programs such as the one organized by Gisela Hymmen at Lenz Elementary School. We look forward to our next event on May 3-4 at Rail City Garden Center. Rosemarie has been challenged to publicize our event because we do not have a not-for-profit status. On July 12, we will join the Reno Rose Society for the annual Art Town arts event. Thanks to the Reno Rose Society, we will be able to showcase OSNN with an orchid display and brochures. The Rose Society is a not-for-profit and is therefore able to get location space and other benefits donated. Joanne Gerow is working hard to get that same benefit for OSNN so that we will not have limitations to what we can accomplish. Please pick up and wear your name tag, that helps all of us to get to know each other faster, especially our new members in 2014. All name tags will be collected and entered in a special orchid raffle. My love affair with the Bulbophyllum orchid started at my first orchid show. I purchased what is probably the queen of all Bulbophyllums, B. Echinolabium. Since that time, I have become completely infatuated with them. It took almost three years for my B. Echinolabium to grow large enough to bloom.I joined the Sacramento Orchid Society shortly there after and soon met someone who has been a mentor, friend and fellow Bulbophyllum enthusiast, Howard Gunn whom I can’t thank enough for his kindness and generosity.My current collection consists of about 350 Bulbos., which I grow in two greenhouses dedicated almost exclusively to this one genus.Bulbophyllum is the largest genus in the orchid family, with 1805 species. This genus was first described by Louis-Marie Aubert du Petit-Thouars in 1822The scientific name has been derived from the Latin word bulbus (bulb-like) and the Greek word phyllon (leaf), referring to the pseudobulbs on top of which the leaf is growing. ( pronounced: bulb-oh-fill-um).In this talk, I will introduce you to as many Bulbophyllums as time will allot and and tips on how I grow them. I suspect you may be shocked by what you will learn. I hope you enjoy my talk and please feel free to ask questions. Bringing a snack for our break time also earns a free raffle ticket. Display and sale table set up will be on Fri May 2 from 2 to 5 pm. PLEASE, bring your blooming plants on Friday afternoon. Sat. May 3 1pm Repotting (Joanne) –WE NEED VOLUNTEER POTTERS! Sun. May 4 11:30 am Repotting (Joanne)–WE NEED VOLUNTEER POTTERS! There will be a $5.00 per plant charge for repotting. Please come sit with us awhile and help us sell and answer questions for a long as you can on any or all days that work for you! We all have times when we realize we have too many of one variety of orchid or an orchid has outgrown its pot and needs dividing or that the ‘miniature’ has become too large. Perhaps you have a plant that is just not happy in your windowsill but would be happy in someone’s greenhouse. The April meeting is your chance to sell it or work a trade with other OSNN members. Bring your orchids that need a new home. You can bring as many plants as you wish. This meeting will combine sales, trades and socializing. Members can negotiate among themselves. OSNN will not charge a percentage. Don’t forget to bring your ‘show-and-tell’ plants. Also, circle May 3-4 on your calendar for our show and sale at Rail City Garden Center. This is another important event that allows OSNN to bring growers and other orchid experts to Reno. Sarah Fletcher, Betty and Thad Holcomb, Christine Kratzer and Peggy Ragsdale. March 2005 18th World Orchid Conference in Dijon France. Hospitality: With its focus on OSNN’s social side, April’s meeting promises to be a most pleasurable one for all of us. Naturally, having something to munch on as we mingle, and meeting our new members, will add to the fun. Please consider bringing some sort of “finger food,” such as a light hors d’oeuvre or dessert, to contribute to our snack table. Plates and napkins will be provided. Don’t forget – your contribution earns you a free raffle ticket! Questions or suggestions? Contact Pam McAllister, Hospitality. Orchid culture and growing tips: http://www.orchid-care-tips.com/ is a great site for beginners and experts to learn more about growing orchids. Also check out the LINKS on our website www.osnnv.com for more information about orchids. Do you have stuff for next month’s newsletter? If so then contact Gisela before the 20th of the prior month. Submissions may be edited for content. Lenz Elementary School Feb. 11th 2014. Aside from blooming orchids we had lots of orchid pictures, seedlings in flasks, and seedpods. The children liked touching the orchid growing material (bark and moss) we had in our display, and learned about the seedpods. 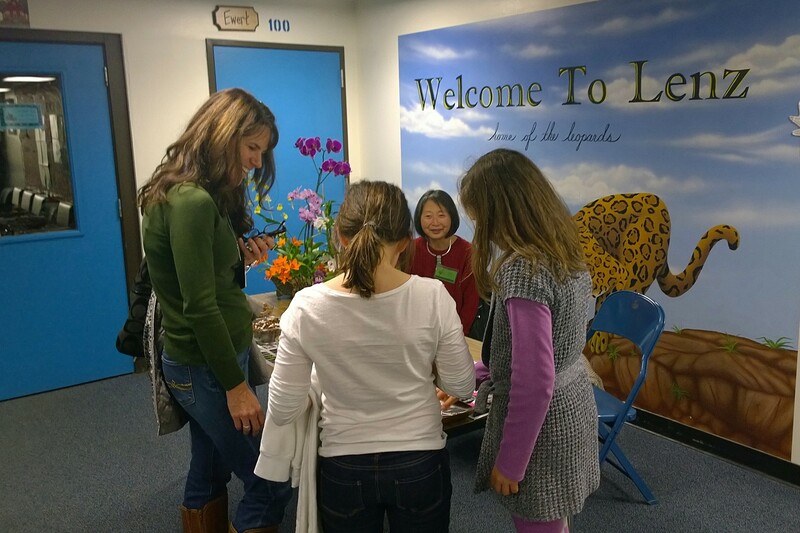 Parents also showed interest in our orchid society. Our Annual Orchid Show and Sale Feb.7th– 9th. It is not too late for members to volunteer for a time slot to help with the show Contact Rosemarie. We encourage everyone – especially beginner and novice growers to bring and enter their blooming orchids in the show, you might just win a ribbon! Please do not bring plants prior to 4 pm unless you are assisting with table set-up! Thank you OSNN for being so welcoming and supportive of our invited speakers. The feedback we have received is that they enjoy coming to a club where the members not only welcome the speaker but each other as well. We are able to bring orchid experts to Reno because of your support of OSNN shows, plant sales at local garden centers and our club plant raffles. We have an upcoming show and sale at Moana on February 7 through 9. Please bring your blooming plants and don’t forget to volunteer. Welcome new Members: Billie and Robert Ratko. Please pick up and wear your badge, and you will have a chance to win an orchid in our special raffle. Attachments: Jan. board meeting, Kathy Robal’s Bio. . Please open OSNN 014 Orchid Show for all the details about our upcoming Moana Show! Renew your membership, $25 for a single, and $40 for two in a household. Please give your check or cash to Heather. March 31st is the cut-off date to renew your membership and continue to receive our monthly OSNN newsletter. Our large selection of beautiful exotic Orchids for sale. 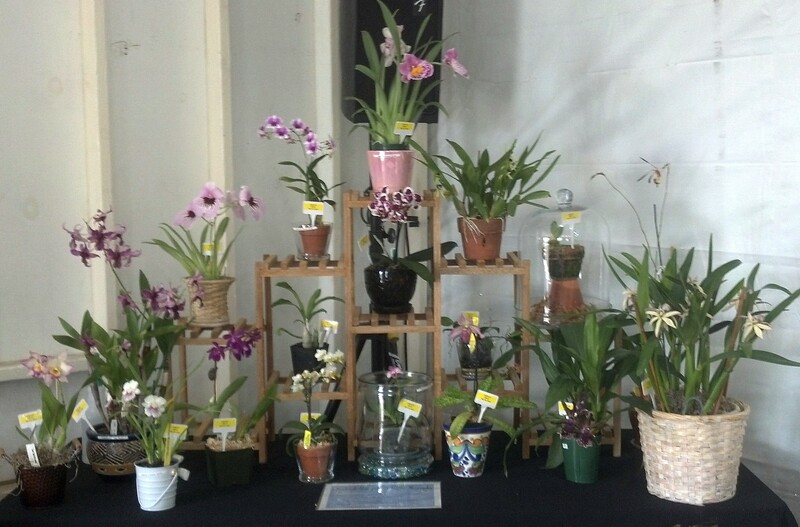 Display Showcase of Orchids grown by our members. 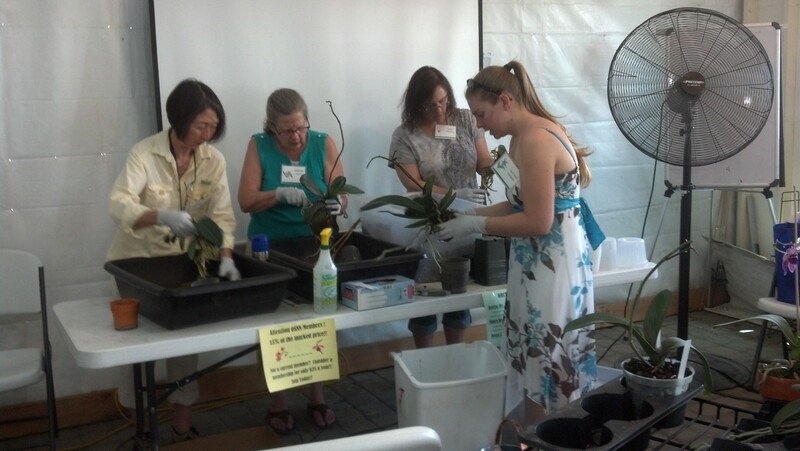 Taeko, Barbara, Holly and Heather are busy re-potting Orchids. We are pleased to announce that starting April 4th 2013, the Moana Landscape and Design Center, (1100 West Moana Lane in Reno) is the new location for our monthly meetings.